On this week's installment of Weird Comics History on the Weird Science DC Comics Podcast (now with a new domain! www.weirdsciencedcomics.com), Reggie and I discussed the British invasion of the eighties into the nineties at DC Comics. We discussed such awesome creators as Alan Moore, Neil Gaiman, and Brian Bolland. One fella we discussed is the (not even British!) Grant Morrison. We both have a great affinity for his take on the Doom Patrol, and I think we both employed a tremendous amount of restraint in not totally derailing our topic for a several-hour gush session over his run. 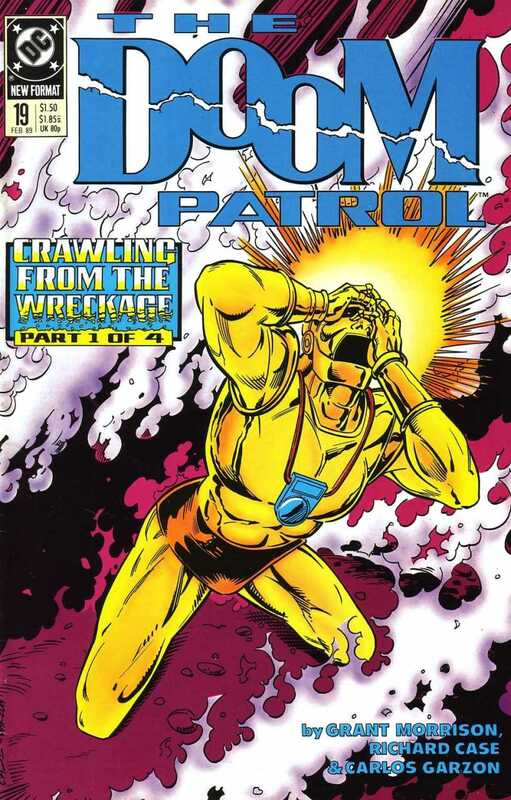 I think today is as good a time as any to dip our toe into Grant Morrison's Doom Patrol. This is one of those runs that I hold in such high esteem that the thought of reviewing it feels rather intimidating. This book dredges up so many emotions, and an odd sensation of comfortable discomfort that I'm not sure I'll be able to summon the proper words to truly do it any justice. Before I try, I suppose I should give a bit of my background with this title. It was around the turn of the century, and Marvel's X-Men had just made their silver-screen debut. The mutants were primed to be bigger than ever... only problem being, the books were damn near impenetrable for any potential new reader. Legendary X-Men creator Chris Claremont had just recently returned to the X-Family after about a decade away. Many a Marvelite was excited that this meant a return to the brilliance of his first decade-plus run. What we received instead were meandering stories featuring such luminaries as the Neo, The Goth, and the Twisted Sisters. Marvel was in a bit of a flux at the time, longtime Editor in Chief (and current DC EiC) Bob Harras was ousted in favor of Bill Jemas and Joe Quesada. This new regime was quick to fix any series they felt were flagging, including the Claremont X-Run. It was announced that (adjectiveless) X-Men would be renamed New X-Men, and would be written by a fresh off the JLA Grant Morrison. Should be good, right? I mean, he did write Doom Patrol after all. Doom Patrol? That book from the early nineties whose covers made me feel uncomfortable? Those covers sometimes looked like what I can only describe as "meat sculptures". It looked as though meat was manipulated into the form of characters... it bugged me. I never read an issue because the covers were just so damn creepy and off putting... which is a true shame. With Grant's impending arrival on New X-Men, I made it my duty to start tracking down some of his old Doom Patrol works... and boy, am I glad I did. The Doom Patrol has grown to be one of my favorites... and is what I call a "comfort food" title, a distinction and title I've given to a choice few runs in comic book history. Something I read through probably once a year... and something we're gonna discuss the opening chapter of... right now. A race car is heading into the home stretch at breakneck speed. An oil slick on the track causes the car to skid before flipping and ultimately exploding. A mangled mess of a man emerges from the wreckage holding what remains of a human brain. This is Cliff Steele's recurring nightmare... a dream whose origins are only too deeply rooted in reality. Robotman awakens from slumber with a scream, an orderly rushes in to check the situation. Steele appears to be a patient at a behavioral health facility. He harshly dismisses the orderly and proceeds to sulk. The other party on the call is revealed to be Niles Caulder, the Chief. He has been calling around to check in on the members of his Doom Patrol in light of recent events. He is joined by former Doom Patrol member, Joshua Clay (Tempest). The Chief attempts to convince Clay to join his newest incarnation of the team. Josh steadfastly refuses, citing recent deaths and injuries... as well as a desire to put the superhero life behind him as rationale. Back at the Unit, Robotman receives a visitor in the form of Will Magnus, the creator of the Metal Men.... and Cliff Steele's current metallic body. Magnus offers his services in order to help Cliff get over his current state and get back to his Doom Patrolling ways, and is not-so-subtly told where to stick his concern. We rejoin Dr. Poole as she checks in on Larry Trainor. They engage in a bit of flirtatious small talk before Eleanor leaves. No sooner does she leave than Larry becomes haunted by a voice calling his name. Suddenly there is a pitch black humanoid form surrounded in a sort of psionic energy staring in through his window begging to be let in. We now observe Cliff Steele heading out of the ward to the yard, Magnus in tow. Cliff laments over his condition, referring to himself as a total amputee... he has phantom pains where all of his limbs once were. When the subject of the Doom Patrol arises, he blames the team for the deaths of several of his friends. He finally breaks down and begins smashing his metallic head into a brick wall wailing over how he doesn't feel anything real... and begs for it all to end. Back with Larry, the black entity enters the room. It reaches for Larry's hand and states that it also requires "thewoman" Dr. Poole for something it calls the Alchemical Marriage. Amongst the sweeping madness, Poole enters the room. The entity takes her hand... and three suddenly become one. Back to Cliff... He and Magnus are back inside, and Will is getting tired of attending this pity-party. He tells Steele that there are people with problems far worse than his. Robotman snaps back to contest that claim... Magnus then takes him to meet Crazy Jane. Crazy Jane is a multiple personality case whose condition arose as a way to cope with trauma. Following the events of Invasion, her meta-gene has been activated granting each of her personalities a distinct superpower. When we meet her, she is outside painting in the midst of a downpour. Cliff gives her a somewhat pleasant though perhaps simply curious greeting and gazes into her painting. A hand emerges from the canvas as an illustration of her potential powers. Magnus excuses himself, and shortly Robotman invites Crazy Jane to come in out of the rain. Meanwhile on a busy city street, a car t-bones a bus at an intersection. From this wreckage stumbles out a smoking skeletal figure holding a black book who mentions something about Scissormen. Shortly, the police are investigating the book, only to find that the pages are completely black. Not knowing what to make of this the officers begin calling up the chain of command knowing it will ultimately lead to one Niles Caulder. The issue closes out with a four (!) page letters column discussing the latest few issues of this volume. The letters are a mixture of praise and critical. Of special interest, there is brief mention that current inker Carlos Garzon has chosen not to remain on the title citing "a variety personal reasons". For what it's worth... I thought he did a great job here. Now here's a book that really pulls you in. I could only imagine what was going through the heads of regular readers of this title. Going from the good-but-cartoony art of Erik Larsen to the opening page of this issue must have been a true shock to the system. The Paul Kupperberg run wasn't a bad one by any stretch of the imagination... the only real criticism is that it felt "safe". Compound that with Morrison's outside-the-box take, and you can see the stark contrast between the two eras. For me (and I'd have to assume many others), Doom Patrol #19 was my introduction to these characters. At the time, I'd never read anything with Robotman, and never even heard of the other characters. Morrison does a wonderful job of introducing them and helping even a new reader with passing interest (at best) feel emotion toward them. This is especially true in the case of Cliff Steele. Having checked himself into a psychiatric facility to deal with what's become of his life... you see a man at the end of his rope. He is hopeless, and try as he might... can never end his suffering, either by treatment... or by ending his own life. His condition is heartbreaking, and one you usually wouldn't associate with a comic book superhero. He laments his inability to react to the sight of a beautiful woman... how he feels like he has to use the restroom before remembering that he doesn't have any bowels. Cliff is clearly a prisoner in his metal shell, meandering through this living death day after day. Characterization like this is why Grant Morrison is among (and sometimes atop) my list of favorite writers. Richard Case's art is great as well. I mentioned during the podcast that I felt it seemed "flat... but purposely so" I'm not sure it made sense when I said it, and seeing it in print... I'm still not sure, but I'll stand by it because I feel the same way now. It really brings me into the time in which this book was produced... there is a very strong late-80's gritty indie vibe here, and it's absolutely perfect. This issue (along with the entire Morrison run) has been collected in a Vertigo-branded trade paperback collection. Many people fail to realize that though this run is darker, it is still a strictly DC Comics book. Doom Patrol wouldn't move to the Vertigo imprint until the Rachel Pollack run. Hell, this issue, while not brandishing the Comics Code Authority seal of approval does also not feature a "Suggested for Mature Readers" branding usually reserved for books of this ilk. Definitely check this series out. Whether in single issue, collected editions, or in digital format. You would do yourself well to read through what one of the (in my opinion) greatest runs in comic book history. Hey man is that Freedom Classic Rock? I had been reading Paul Kupperberg's run half-heartedly before this came out--but to be honest, I don't think it was a "shock" so much as an enthusiasm to go from reading a third-rate X-Men rip-off to something completely unique in the world of comics!